Our mind is so focused on scanning our environment for danger that it is much easier for us to think negatively. Focusing on positive things is much more difficult and takes some discipline, particularly if you are trying to adjust your thoughts this way. One way that will work for you is using whomever you use as a focal point for your religious worldview. Whether you use Christ, Hari Krishna, Rumi, Confucius, Muhammad, or the Buddha, the effect will be the same. I don’t know of anyone who can think negatively while keeping their mind on Christ or any other spiritually elevated individual in history. By keeping your attention on one of these spiritual giants (One that has special meaning to you), negative thoughts will leave you while you practice this exercise. Once you begin the practice of focusing on the positive, your outlook will change. Things that may have bothered you in the past will no longer trouble you. You’ll feel a calmness begin to take over your being. You will relax. Folks, as you’ve probably noticed, I’ve not been working out this week. I’m afraid my Mother’s issue last week, through my schedule out of whack. Since she’s come home, I have to help with cooking, run more errands, and help my Dad out with some of his appointments (he no longer drives a car). I know some folks when they begin a workout routine do not want to let anything disrupt their routine, but frankly, this is not realistic. Life happens and you will be disrupted by it because that’s just the way life is. Life is one big dice roll and it is better to ride the wave than fight it. I’ve decided to kick in my routine again tomorrow, now that my Dad’s appointments are knocked out. This leads me to my next topic–documentation. I cannot tell you how important it is to document what you do (or don’t do) in the gym. This should be done while you’re there, so you don’t miss any weights you are using, or any special things you learned that day. Your body is a terrific teacher. It will tell you when it is stronger, weaker, or just plain tired. It will tell you that it’s ready to go and will also tell you to take one more minute of rest. The only way to truly hold yourself accountable is to document what you do. You pretty much track the things you eat and the weights you use for each exercise, along with the number of reps you complete. If you do this, it will be very easy to pick up right where you left off. Realize the body will do what the body will do. You need to be careful when setting goals because if you push yourself too hard, you will burn out and stop going to the gym. On the other hand, you don’t want to set your goals too low either. This will only result in you doing what I call as “sandbagging”. Sandbagging is doing less weight that you need to be doing. Don’t let yourself fall into this trap. The only way you gain muscle mass is by increasing the loads you work with or the number of reps or a combination of both. If you are not pushing your limits each time you go to the gym, even if it’s only a 2.5lb increase in weight or maybe one or two more reps, you will not see the improvements you seek, but I digress. Let’s talk about the goals you have. My goal is simple. I want to remain healthy, increase my muscle mass, maintain my bone density, and have good endurance. Muscle mass is gained very slowly. The changes in your muscle mass and body composition are so minute that you will not see them instantly. They improve over time. The easiest way to gauge yourself is to take a photo of yourself at the beginning of every routine you begin and one at the end. You can also track your weights. The more weight you are pushing, the bigger that muscle is getting, even though you cannot see it yet. I’ll get into more specifics tomorrow. Hope everyone has a great Thursday!! This is a very important point. Love is the most important thing in this universe, but many only think about intimate love. The love this quote addresses is an impersonal love or the ability to wish everyone well around you. When you put love into a meal or any task for that matter, it makes a difference to those receiving the benefits of your labor. Love changes the taste of the food, love changes the quality of the work, love converts everything to a better state. I wish each you of you a wonderful day, filled with love! 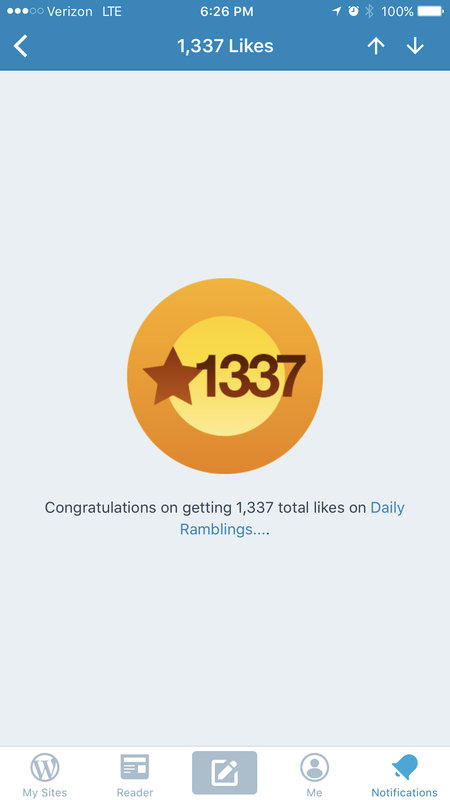 Daily Ramblings – Thank You!! This is beyond awesome. Thank you readers!!! Sorry for being a “ghost” the last few days, missing my workout and quote postings. I had a family emergency that through my schedule out of whack. My Mom was hospitalized for a few days (Wed – Saturday) and is just now starting to recover. I’ve had to take over cooking duties, as well as some other things Mom normally does, while she convalesces, including taxiing my dad around to his various doctor appointments. I’ll be back on tomorrow and get back on track with posting my workouts and quotes. Thanks for your patience!! No doubt about it Readers! Your health is everything. I don’t know about you, but when I am sick, I am absolutely worthless. I don’t feel like doing anything but sleeping or lounging on the couch and binge-watching a television show on Netflix, Amazon Video, or Hulu. Getting sick is also expensive. You miss work, you fall behind in your assignments (if you’re in school), and then there are the bills to pay for a doctor’s visit, medicine at the Drug Store, and all the rest. Our bodies adapt to their environments. This is the miracle of the human body. If you exercise it, it stays strong, it endures, it repairs itself. If you fail to exercise, your body will degrade. It is an efficient machine that will only adapt to what it is exposed to. If you do not exercise, your body will adapt by reducing musculature, reducing bone density, reducing flexibility, and a whole host of other internal mechanisms. If a person ignores exercise, it is almost like a slow suicide. If you do anything for yourself this year—get out and exercise. Whether it’s a push-up or sit-up, a 5-minute walk, or perhaps a plank for 30 seconds—get out there and move! I hope you are having a great Tuesday!! Today you’ll notice a big twist in the workout routine. This workout utilizes a technique called pre-exhaustion. This is how it works. This workout begins with single-joint exercises and progresses to multi-joint exercises. This is exactly opposite to our workout routine last week. The reason for this is to ensure the muscle you are working is totally exhausted and shocked during the workout. Believe me, my pecs and triceps were screaming at the end of this workout. On the even weeks of this workout, you’ll see progressive rep increases and lower weights. I hope everyone has a great Tuesday! Today was Leg Day! Many bodybuilders dread this day because it is by far the most taxing of workouts. Your Quadriceps, Hamstrings, Glutes, and Calfs are all taxed. The larger the muscle you work, the more taxing it is on your entire system. I find on Leg days that my circulatory system is taxed the most. I am always out of breath at the end of an exercise and typically have to take 2-3 minutes breaks between exercises to recover sufficiently before moving on to the next exercise. Today, let’s address a few more topic areas: Muscle Soreness, Beginning a new workout routine. When you have sufficiently attacked a muscle group, you’ll discover that within 24-48 hours you’ll begin to feel some stiffness and achiness in the muscle groups you’ve worked. This is because you actually do physical damage to your muscles if you work them to failure. Working muscles to failure result in the microfilaments of your muscle fibers to rupture. When this happens, the body adapts by building a larger microfilament to replace the one that was damaged. The easiest way to get through muscle soreness is literally just working through it. You don’t need to take a day off or any of that. Just get in the gym, get the blood pumping, and work through it. By the time you’ve hit your second or third exercise you’ll notice that the pain is gone. Don’t let muscle soreness wreck your schedule. One trick to avoid too much soreness is to incorporate some cardio into your routine. You can do 20-30 minutes on the treadmill, add cardio acceleration to your workout, or some other type of High-Intensity Interval Training (HIIT) in between your weight lifting exercises. This cardio work will keep the blood flowing, help your muscles clear out any lactic acid that has built up, and minimize the amount of soreness you may experience. You can also hit the sauna after your workout, take a hot shower, or take a really hot bath when you get home. All of these will minimize muscle soreness from workout to workout. If you’ve been following my workouts, you’ll notice that some of the exercises I am working through on this new routine are actually utilizing lower weights than those I achieved toward the end of the Shortcut to Size program. When beginning a new routine, my goal is to complete the routine. Since a new routine puts different stresses on different parts of the body and because this workout is more grueling than the previous routine, I always start with a lower weight on a new routine to better allow my body to adapt to it and avoid any senseless injuries while trying to do too much too quickly. This leads to another quick chat about motivation. We all have our own personal drivers as to why we do something. Mine is literally nothing more than maintaining my health. There are a lot of folks who are in the gym to make themselves look better, but for me, it isn’t about aesthetics. I literally want to continue to feel good, sleep good, maintain low levels of stress, and continue to improve my strength and endurance as long as this body will allow me to. I’ve taken the day off to celebrate Father’s Day. I hope each of you who is a father has a terrific day today. I also hope that you, my readers, take a minute to send your love to your Father. He raised you, supported you, and worried about you (more than you’ll ever know).